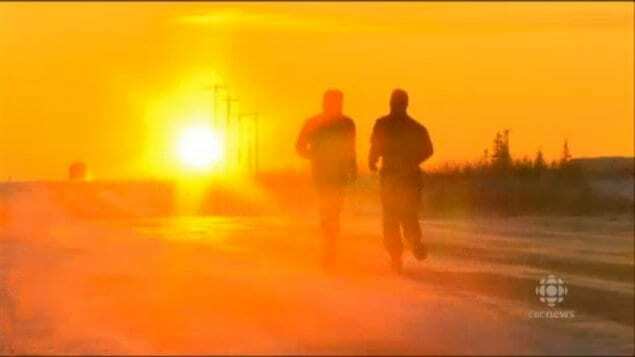 Runners chased the rising sun at the start of Churchill, Manitoba’s 2nd annual Polar Bear Marathon. Twelve runners braved sub-Arctic cold and the threat of hungry polar bears to complete a 42.2 km marathon in Churchill, Manitoba last Friday, November 22. Churchill is located on the 58th parallel but is much colder than other places at the same latitude. This is because northerly winds blow down from the North Pole across the huge expanse of Hudson Bay which is now freezing up. “It (the marathon) is an adventure to test your body, to see how well you can do your endurance,” said James Buhler, who came in second place. The wind chill meant the temperature felt like -38 C as the runners started the race. Each one had a support vehicle following to provide safe haven from the cold and protection from polar bears that roam the region. “It was the sixteenth marathon I’ve done, but absolutely the hardest one,” Sven Henkes said after crossing the finish line first with a time of four hours and 12 minutes. His prize was a stuffed polar bear presented by someone in a polar bear costume.